You may have suffered from a wind chill when you stepped out the door today but retailers are about to receive spring merchandise. For the man who is always ahead of the game when it comes to style, take a look at what Versace has in store for you. With a collection full of bright colors and classic Versace silhouettes, some of the jackets were shorter, slim and very contemporary. An assortment of double-breasted jackets in shades of grey, camel and black are also key items in the collection. 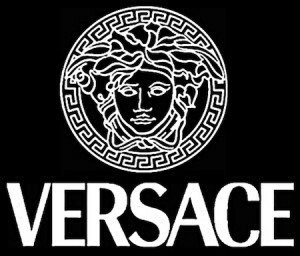 The spring line also features some printed shirts with the classic Versace baroque inspired patterns. The waist on some of the pants were cut higher than normal making it best worn by a slimmer man. 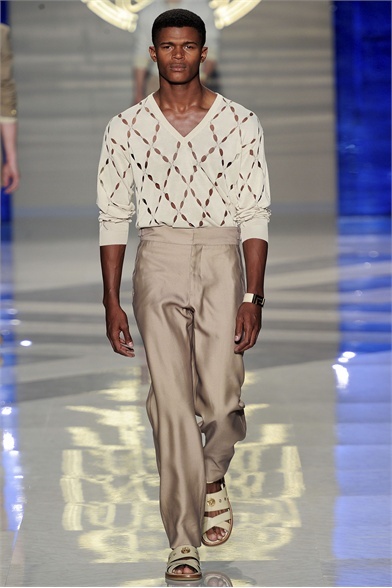 Most notable was how Donatella Versace used red, pink and coral in men’s sport coats and suiting. 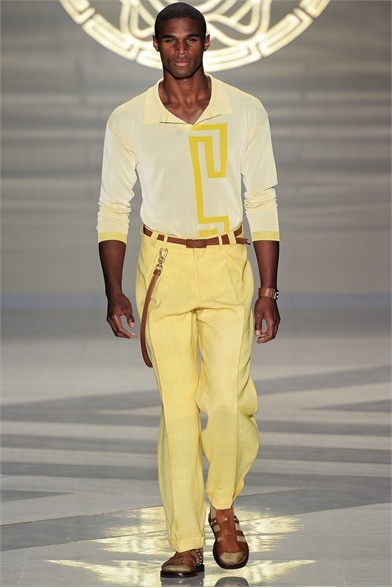 It was almost like a modern take on the fashion of 80′s TV series Miami Vice. It takes a confident and daring man to wear a red or pink suit. It’s not a look for everyone. Watch the full runway show for the entire collection below.